← Do You Have the Balls to Be Great? My wife did. Do you do them? No. I’m very familiar with the technology, but it’s just not right for my practice. It has its place in dentistry. But, I prefer lab-fabricated restorations. And, he seemed satisfied with that. We proceeded with his new crown. Is that why it’s sensitive? My explorer could easily fit into the open facial margin. She could “feel that.” Blowing air into it also caused sensitivity. The x-ray image above came from the Iowa office. Note the cement thickness. It appears the crown was not seated completely. The decay on the facial extended about 3-mm deep. Now… this blog article is NOT intended to start a “Cerec vs. Lab-made” flame war. I realize that lab-fabricated crowns can also have open margins. And, I also acknowledge that we ALL have had less-than-ideal outcomes with our work. My point is that we all should recognize our own poor results and make them right. So, how do we approach the situation with the patient, without throwing the other dentist under the bus? I simply told her that this result was less than ideal. I told her that every dentist that has practiced for even a short time has some of these under his / her belt. It’s just a matter of the timing of her move back to Florida and when the less-than-ideal result was recognized. The bottom line is that the crown needs to be replaced, and I’d be happy to do it. She seemed fine with it and did not express interest in contacting the previous dentist about it. She’s in the schedule for the new crown. How do you deal with being the “bearer of bad news?” What if the dentistry was recent? Chime in below! 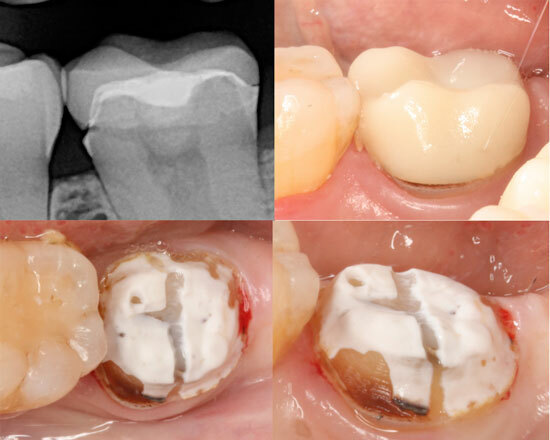 This entry was posted in Practice Management, What Happened Today and tagged cerec, crown, dental do-overs. Bookmark the permalink. 18 Responses to How Do You Tell a Patient Her New Crown Must Be Replaced? I had the same scenario yesterday, guy had a crown sensitive and it was made by the local “chain” group. This crown also had a visibly open contact, at least a full 1.5 mm which he was packing food in. I was very gentle with saying that it looked like they just didn’t have their best day abs it happens to everyone. He agreed it should be replaced, but upon hearing there would be no insurance coverage elected to pass. The replacement period is 5 years, I explained more negative things could occur to the tooth, gums, and surrounding tooth in that time frame. He agreed, but decided to chance it. Man people are dumb sometimes. Often because it’s a crown, we feel hesitant to tell the patient the bad news, even if the tooth is pain free. This is where digital x-rays and intra-oral photography are a plus. ( I acknowledge the pros and cons of digital x-rays.) I tell the patient, show the patient, explain that we all have had this occur in our careers and that I would remake it for free if it were one of mine. With her being out of state, it makes it hard but that a new crown is needed. I do not degrade the other dentist because…it happens. As a matter of fact, I never make negative remarks, it’s very unprofessional. (What I think is another story!) If the patient wishes to contact the other dentist, I provide a copy of the x-ray and the photo and step away. I do not get involved as it is self explanatory. What the other dentist does is his/her business, not mine. I am not sure how digital x-rays help…this would show up fine on my film. I think you did a great way in how you approached this. I would love to think that I have never had an uh oh, but I would by lying to myself. Clearly, this crown should be replaced and I love how you did not throw the dentist under the bus. I do my best to not do that too….1) because I believe in Karma and I also have bad days and 2) because this lady might have been holy hell to work on….even then…it should be replaced. I have thought about adding in house milling in a few years…but I am not sure that I want to be a lab tech. I drive my own lab crazy with being picky about shade/esthetics, and they deliver. Kuddos to those that can do everything, I know I can’t! It’s disappointing that a dentist would insert a crown which is so poorly sealed. Yes there is NO anatomy either, but that is secondary to the marginal fit. I must add, Dental Warrior, that digital radiographs ARE the way to go. At least for the Team who has to deal with the ridiculous headache of developing.. And the chemical waste… And having to keep charts.. BLECH!!!! Time saved in going digital is rather significant in many aspects. I would interest in reading a post on why digital isn’t your cup of tea. Quick and dirty… I spent a year working the practice next door to me (the dentist was hit by a car while riding his bike). His office door is 30 feet from mine. I spent the entire year working in both offices every day. He was digital. Film for me. Bottom line: Diagnostically, film is FAR superior to digital. It’s not even close. Anyone who says otherwise has simply not compared the two, side-by-side, every day for a year. Furthermore, current literature supports my position. 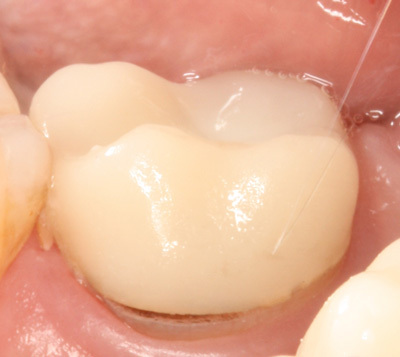 Film is particularly better at revealing interproximal caries and apical bone lesions. So… $40,000 just doesn’t make sense for mere convenience (and a lower quality image). I have not compared many images side by side…. I also like the ability to zoom, measure, color invert and manipulate the images. Also, the ability to search for images is super awesome! Rightly said it is important to know the dental problem in the early stages of occurs. Therefore X-ray should is the must and consulting the best dentist is also important. A positive w/ digital radiographs is that they can be enlarged to the entire size of the computer display (one is located in every treatment room). The patient easily sees the open margins, interproximal caries, resorbed root, apical lesion, incomplete endo obturation, position of impacted tooth, congested sinus, etc., etc.. Thus, patients are better educated & receive a superior informed consent process. I also love to demonstrate to patients, how the dental care from their previous dentist was very sound. This helps build confidence & trust. Note: I can only do this if it’s true. I’m not trying to be difficult. I only want to illustrate what works for me. Most clinical methods & materials have their distinct advantages & disadvantages. Yes, it has some conveniences when it comes to educating patients. Though all of that can also be done with film. I do it every day. Digital makes it more convenient. But, it isn’t exclusive to digital. The bottom line is that the diagnostic quality takes a hit with digital. That’s a proven fact. I’m not willing to give that up. Another negative for digital is patient comfort. Sensors are thick and RIGID. They HURT. My office manager just returned from the endodontist (who used a digital sensor). She is no wimp, but will tell you that the pain from the sensor was the worst part of the entire root canal experience. I’ve had many patients tell me the same thing. Film is simply more comfortable. But, my biggest issue with digital x-rays is the compromising of diagnostic quality. I think often times there is more than 1 way to get from point a to point b. People’s body’s just respond differently to different methods. Sometimes I give the patient the option to go back to their dentist. There is a reason they came to you instead of sticking with their previous dentist. Most of the time they come back to me to still have their crown replaced. One time the dentist did redo their sub par work. Then the patient came back to me with all future work. Interesting to read the discussion on whether to use digital radiographs. we converted three years ago to a phosphor plate system with a Durr Vista Scan. Besides my apex locator and loupes this was my “world changing” dental equipment purchase. I love the speed we get to view the films, much easier to view and show patients. and the fact we can magnify and manipulate the images easily. To be honest I hate film now. I never noticed a major drop in image quality, but I do scan at high resolution. I wouldn’t go back to film now. Chiming in as a patient who is in this situation. A crown with open margins was placed in my mouth & the dentist refuses to acknowledge the problem even after I showed him how I can get the tip of my nail under the edge. So now I’m in the position of having to have it replaced by a new dentist and foot the bill for both because of what I feel is unethical behavior by dentist #1. The insurance companies are also a part of the problem. Dentist #1 should not get paid and that benefit should be available to dentist #2 to correct the mess. As it stands the patient gets the short end by having to pay out of pocket and then try to recover money from the original dentist by lawsuit or peer review all with an uncertain outcome because a dentist did a poor job and won’t fix it. This whole system needs a major overhaul to not reward substandard care.